There are so many things to love about October…the weather, the trees, the colors. October also makes me think of Halloween, and, if I’m being honest, what I love most about Halloween is chocolate. 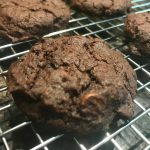 In honor of the deep love of chocolate I have harbored since I was a kid, I’m sharing my Double Dark Chocolate Chip Cookie recipe with you. 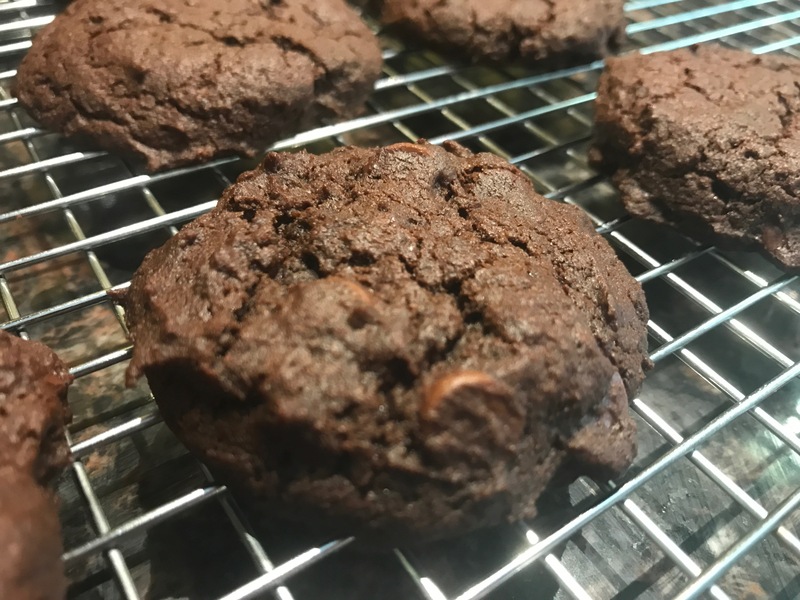 These ooey-gooey cookies satisfy every chocolate craving I have without one ounce of guilt. They also make amazing building blocks for ice cream sandwiches. Just saying! What is Raw Cacoa Powder? Raw cacao powder is made by cold-pressing unroasted cocoa beans. The process keeps the living enzymes in the cocoa and removes the fat, known as the cacao butter. The cold-pressing process helps the cacoa maintain much of its nutritional value. Cacoa contains a high amount of anti-oxidants, and minerals, like Magnesium, Potassium, Calcium, and Zinc. It can also help lower blood pressure, boost your mood, lower insulin resistance, and protect against cardiovascular disease. Chocolate can be good for us. I knew it! This is one of the reasons I use raw cacoa powder in my Double Dark Chocolate Chip Cookies. I like Viva Naturals Organic Raw Cacoa Powder. 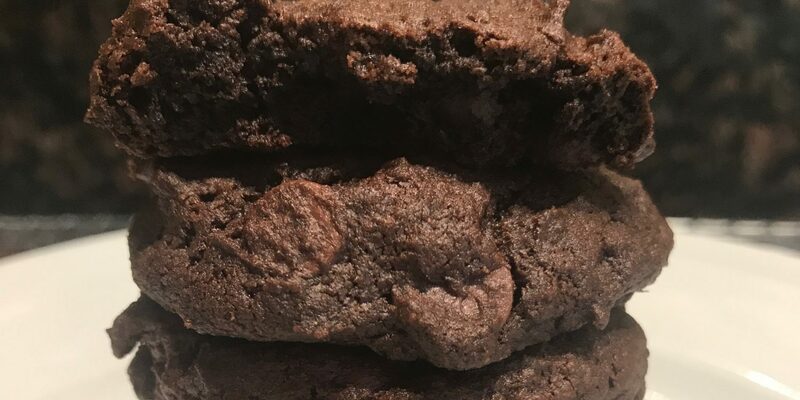 From a baking stand point, raw cacoa and non-dutch processed cocoa powder will work the same. Because both raw cacoa powder and “natural” or non- dutch processed cocoa powder are non-alkalized, meaning they retain their natural acid, you need to use baking soda as your leavener, because baking soda is an alkaline that balances the acid in the cacoa/cocoa. With the right balance you achieve the perfect leavening, even in gluten-free, vegan baking. Cream your EB and shortening with your palm sugar first. This ensures your fat is fully incorporated and there are no sugar lumps. Use raw cacoa powder over cocoa powder. I think it gives a deeper, more pure chocolate taste, andyou get all those awesome nutritional benefits! My cookies puff and crack a little, but there’s still some softness to them because I like them gooey. Bake them how you like them! For best results use the AP Gluten-free flour blend I use or one similar to it. I can’t verify how others will work in this recipe. You can also use Cassava flour for a grain-free option. I like Anthony’s Cassava Flour or Otto’s. Otto’s is pricey. It’s very good, but idk that it’s that much better than Anthony’s for the money. Use quality allergy-free dark chocolate chips, like Enjoy Life Dark Morsels. Or make your own Paleo Chocolate Chunks. I add a little espresso powder to enhance the deep chocolate flavor. Adding a small amount will not create a mocha flavor. To create a Mocha cookie, I would increase the espresso powder to 1-2 TBS. But to simply enhance our chocolate flavor, I add 1 tsp. 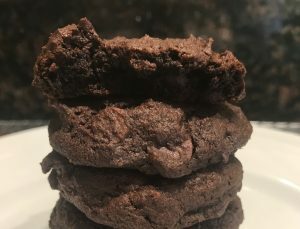 For all natural chocolate use Paleo Chocolate Chunks in this recipe! I use this AP Gluten-free Flour Blend for this recipe. With a mixer beat Earth Balance, shortening, and palm sugar until blended, about 30-60 seconds. Add applesauce and vanilla. Beat until blended, about 30 seconds. Add dry ingredients. Beat on lowest speed. Beat in hot water on lowest speed. Fold in chips. Scoop batter onto lined baking sheets. I use a 1-2 tsp size scoop. Leave 1" between cookies. Gently pat down. Bake for 8-9 minutes or until just set. Remove from oven and let set on pan for a couple minutes. Transfer to cooling rack. Let completely cool before storing. Store in an airtight container for up to 1 week, or freeze for up to 3 months.